Police have confirmed receiving over 120 complaints of assaults, ranging from groping to two alleged rapes. COLOGNE’S POLICE CHIEF has been suspended after sharp criticism over his force’s failure to prevent a rash of alleged sexual assaults during New Year’s Eve festivities. Wolfgang Albers, 60, was put into “temporary retirement,” said mews agency DPA as well as the city newspaper Koelner Stadt-Anzeiger, quoting unnamed local government sources. The news comes as police reveal most of the suspects were identified as asylum seekers. 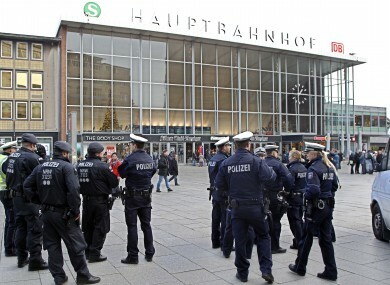 A week after the chaotic scenes outside Cologne railway station, federal police said they had identified 31 suspects whose alleged offences were “mostly theft and causing bodily harm”. Among the suspects are nine Algerians, eight Moroccans, five Iranians, four Syrians, two Germans and one citizen each from Iraq, Serbia and the United States, ministry spokesman Tobias Plate said. Federal police had received several complaints about sexual offences, but “the perpetrators of these have not been identified,” he said at a press conference. Cologne police have separately confirmed receiving over 120 complaints of assaults, ranging from groping to two alleged rapes, calling them apparently coordinated attacks during the year-end festivities. About three-quarters of the cases involved sexual offences, while others related to theft or bodily harm. Victims and eyewitnesses had since the beginning blamed men of “Arab or North African” appearance, inflaming a heated public debate about Germany’s ability to integrate the nearly 1.1 million asylum seekers it took in last year. Right-wing populists have charged that Chancellor Angela Merkel’s liberal migration policy has fuelled crime and destabilised society. Merkel’s spokesman George Streiter said it was “important that the whole truth comes out, that nothing is withheld or glossed over”, but also warned that migrants must not be put under general suspicion or collectively blamed. “Primarily, this is not about refugees, but about criminality,” he said, noting that most asylum seekers in Germany had come seeking protection. Still, the mob attacks have stoked popular anger and fuelled doubts about the biggest influx of asylum seekers to any EU nation, most of whom are from the Middle East and Africa, and led to pledges of a law and order crackdown. Migrants in Germany fear there will now be a backlash against them. One man, Asim Vllaznim, told AFP his family’s first reaction to the news that many involved were asylum seekers was “Now the Germans will hate us”. “It’s a shame what they did at the central station,” said the father of five about the violence in the square between Cologne’s railway station and the city’s famous Gothic cathedral. His own family fled because of discrimination against their Albanian-speaking Ashkali ethnic minority, hoping for a brighter future for their children, he told AFP. “We must do everything to prevent such incidents from happening again,” Interior Minister Thomas de Maiziere told the Rheinische Post daily, pledging “more CCTV cameras in places where many people gather, heightened (police) presence on the streets and harsher penalties”. At the weekend, Merkel’s conservative party plans to agree on tougher policies, including cancelling asylum and refugee status for any convicted applicants with jail terms of any length, and the speeding up of deportations. “We need more police, a better equipped judiciary and tougher laws, among other things to more quickly expel criminal foreigners,” said Volker Kauder, the parliamentary leader of Merkel’s Christian Democrats. Under current laws, asylum seekers are only sent back if they have been sentenced to jail terms of at least three years, and if their lives are not at risk in their countries of origin. And there is a backlog in carrying out officially-ordered deportations. “Citizens expect that those without a right to stay really do leave the country,” Kauder told news weekly Der Spiegel. “We have to act with full force,” agreed Katharina Barley, general secretary of the centre-left Social Democrats, calling the New Year’s Eve violence “a very dangerous mix of organised crime and sexual violence”. Email “Police say most Cologne mob suspects were asylum seekers”. Feedback on “Police say most Cologne mob suspects were asylum seekers”.